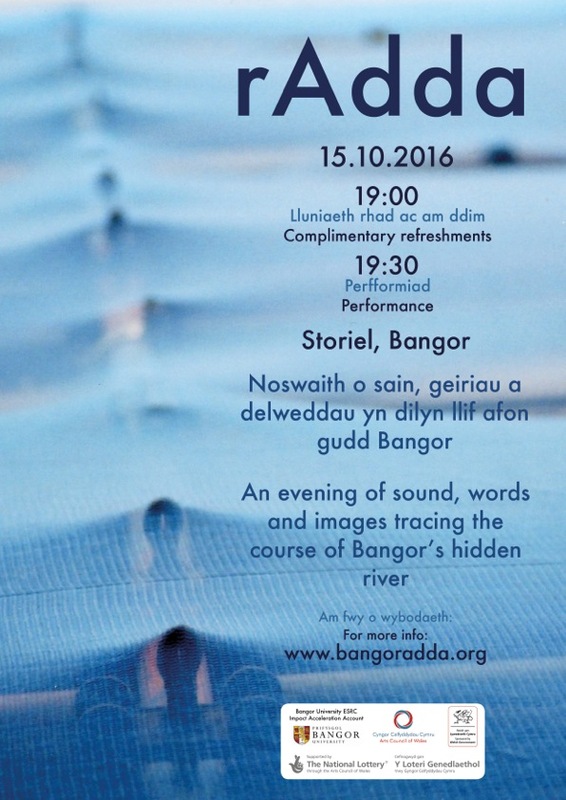 Performance of rAdda, a collaborative exploration of Bangor’s Afon (River) Adda in Storiel. Zoë Skoulding, Cathy Heyden, Alan Holmes and Jean Portante present a performance exploring the hidden river la Bièvre at the Maison de la Poésie, Paris, 1st April 2016. Welsh poets Siân Melangell Dafydd and Zoë Skoulding perform an interactive piece exploring the hidden course of the ‘lost’ river La Bièvre at Maison de la Poésie, Paris on April 1st 2016. This event is a result of a multidisciplinary project focussed on Bangor and its hidden river, the Adda. It will include work by poet Zoë Skoulding, musician Alan Holmes, and visual artist Ben Stammers. A chance to take a new look at Bangor. Ben Stammers and Zoë Skoulding invite you to join their explorations of the River Adda. They will be in the Deiniol Centre on Saturday April 8th 11–3 making a sensory map of the Adda’s route through central Bangor, for which they invite your help. At 12, 1 and 2 there will be a short walk to listen to the river. Join an exploratory walk following the city’s invisible river from source to sea. Share your responses, thoughts, or memories. The walk will finish with refreshments at the Crosville Club, and a chance to contribute to rAdda, a collaborative art project led by Ben Stammers and Zoë Skoulding. Arrangements can be made to bring people back to the start point after the walk.